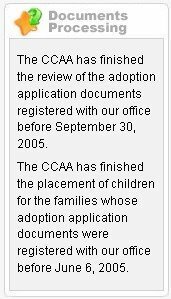 We will attempt to document our adoption journey through this site to keep all family and friends updated. The most recent updates will appear on the top of the page. Thanks for your support. The news came today for the families with log in dates up to June 6th. It is so nice to see the excitement on the June yahoo listserv. While it is not us getting referrals, people I have been on-line with for almost a year are getting theirs. It just makes it all the more real. We hope that our referral will be in the next batch which will come towards the end of May. I will be following the rumor mill very closely next time. I don't know where the people get their information from but they predicted the June 6th cut off as early as 4/20, almost a week before the official word was out.